Background and objectives Serum calcification propensity is a novel functional test that quantifies the functionality of the humeral system of calcification control. Serum calcification propensity is measured by T50, the time taken to convert from primary to secondary calciprotein particle in the serum. Lower T50 represents higher calcification propensity and is associated with higher risk of cardiovascular events and death in patients with ESKD. Increasing magnesium in serum increases T50, but so far, no clinical trials have investigated whether increasing serum magnesium increases serum calcification propensity in subjects with ESKD. Design, setting, participants, & measurements We conducted a single-center, randomized, double-blinded, parallel group, controlled clinical trial, in which we examined the effect of increasing dialysate magnesium from 1.0 to 2.0 mEq/L for 28 days compared with maintaining dialysate magnesium at 1.0 mEq/L on T50 in subjects undergoing hemodialysis for ESKD. The primary end point was the value of T50 at the end of the intervention. Results Fifty-nine subjects were enrolled in the trial, and of these, 57 completed the intervention and were analyzed for the primary outcome. In the standard dialysate magnesium group, T50 was 233±81 minutes (mean±SD) at baseline (mean of days −7 and 0) and 229±93 minutes at follow-up (mean of days 21 and 28), whereas in the high dialysate magnesium group, T50 was 247±69 minutes at baseline and 302±66 minutes at follow-up. The difference in T50 between the two groups at follow-up (primary analysis) was 73 minutes (between-group difference; 95% confidence interval, 30 to 116; P<0.001), and the between-group difference in serum magnesium was 0.88 mg/dl (95% confidence interval, 0.66 to 1.10; P=0.001). Conclusions Increasing dialysate magnesium increases T50 and hence, decreases calcification propensity in subjects undergoing maintenance hemodialysis. Patients with ESKD have a 20-fold higher risk of cardiovascular mortality compared with the general population (1). Arterial stiffness, at least partially due to vascular calcification, has been associated with cardiovascular mortality in ESKD (2). Disturbances in the mineral and bone metabolism seen in ESKD are believed to result in accelerated vascular calcification by inducing an osteogenic dedifferentiation of vascular smooth muscle cells into a bone-like phenotype characterized by deposition of calcified mineral matrix and increased stiffness (3). Thus, measures to prevent calcification might reduce arterial stiffness and consequently, cardiovascular mortality. Serum calcification propensity (T50) is a novel functional test (4) that measures the time point of conversion from primary calciprotein particles to secondary calciprotein particles in serum, and it is believed to reflect the propensity toward ectopic calcification. Secondary calciprotein particles (but not primary calciprotein particles) have been shown to induce vascular calcification in vitro (5), and low T50 has been shown to be associated with cardiovascular events and all-cause mortality in ESKD (6), CKD stages 3 and 4 (7), and kidney transplant recipients (8,9). Increasing T50 might, therefore, prevent calcification and reduce the incidence of cardiovascular events. Addition of magnesium (Mg) to serum increases T50 in vitro (4), and thus, Mg treatment may be useful in improving T50. Increasing dialysate Mg is a simple, inexpensive, and effective way of increasing serum Mg, and it might, therefore, also be effective in increasing T50. To study this further, we conducted a randomized, double-blind, controlled clinical trial, in which we tested whether increasing dialysate Mg from 1.0 to 2.0 mEq/L would affect T50 in patients with ESKD on maintenance hemodialysis (HD). We hypothesized that increasing dialysate Mg for 28 days would increase T50 and that T50 would return to baseline 14 days after returning to standard dialysate Mg. This trial was an investigator-initiated, randomized, double-blind, parallel-group, controlled clinical trial that was conducted from March to June of 2017 at the dialysis wards of Nordsjællands Hospital (Hillerod, Denmark). Subjects were randomized in a 1:1 ratio to 28 days of treatment with either standard dialysate Mg (1.0 mEq/L) or high dialysate Mg (2.0 mEq/L). 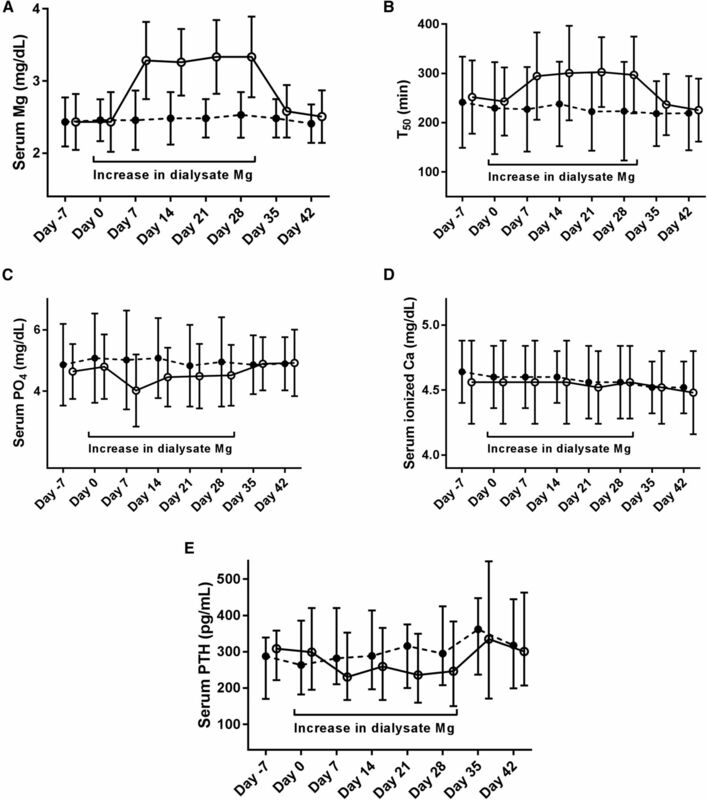 After the 28 days of intervention, subjects returned to their regular dialysis regimen with standard dialysate Mg of 1.0 mEq/L, but they were followed for another 14 days to assess any changes occurring after the intervention. Subjects were numbered consecutively as they entered the trial and allocated to treatment using a computer-generated, block-randomized randomization list. Treatment allocation (i.e., the product number printed on the dialysate containers) was printed and placed in sealed opaque envelopes, which were opened by the staff at the dialysis wards before the dialysis session on day 0. For the purpose of the trial, 6-L plastic containers with dialysate (MTN Neubrandenburg GmbH) were used throughout the interventional period of the trial. Containers with standard dialysate Mg had concentrations of Mg and chloride of 1.0 and 108.5 mEq/L, respectively, whereas containers with high dialysate Mg had concentrations of Mg and chloride of 2.0 and 109.5 mEq/L, respectively. Apart from this, all other components of the dialysate were identical (i.e., sodium, 138.0 mEq/L; potassium, 2.0 mEq/L; calcium [Ca], 2.5 mEq/L; bicarbonate [HCO3], 32.0 mEq/L; and acetate, 3.0 mEq/L). The containers were identical in appearance, except for information regarding dialysate Mg concentration and product number. Dialysate concentrations were obscured with a black felt pen such that nurses were blinded to dialysate Mg concentrations, and during the dialysis treatment, the dialysate containers were positioned such that the product number was hidden from the physicians and subjects, thus ensuring that all physicians, nurses, and subjects were blinded to treatment allocation during the trial. For the duration of the trial, no changes were to be made to medications that might influence the bone and mineral metabolism (i.e., phosphate [PO4] binders, Ca supplements, active or inactive vitamin D analogs, calcimimetics, or intravenous iron) unless strictly necessary and only on approval from the primary investigator. 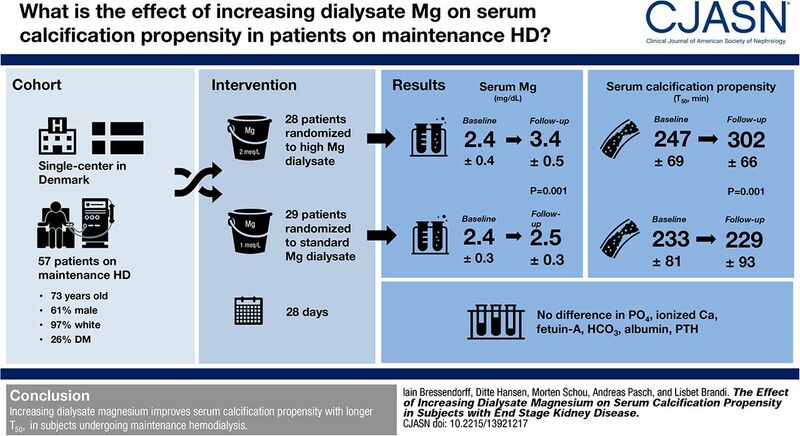 We prespecified serum Mg >4.4 mg/dl as an upper safety limit, such that any subjects exceeding this threshold would immediately return to their regular dialysis regimen with dialysate Mg of 1.0 mEq/L. The primary end point was the value of T50 at the end of the intervention period (mean of days 21 and 28) between the two treatment groups (see below). Secondary end points were change in T50 from baseline to the end of the intervention period, changes in markers of mineral and bone metabolism at the end of the intervention and their changes from baseline, and incidence of adverse events. All patients undergoing in-center HD at the dialysis wards were screened, and eligible patients were approached in conjunction with their regular HD treatment and offered participation in the trial. Inclusion criteria were age ≥18 years old, treatment with maintenance in-center HD for >3 months, serum Mg <2.9 mg/dl, negative pregnancy test and actively using contraceptive therapy for women of childbearing age (contraceptive pills, estrogen depots, or intrauterine device), and ability to give written informed consent. Exclusion criteria were treatment with peritoneal dialysis; serum intact parathyroid hormone (PTH) >620 pg/ml; previous parathyroidectomy; dialysate Ca of >2.50 mEq/L; current treatment with Mg-containing medication or supplements; diseases or conditions that, in the opinion of the primary investigator, would prevent participation in or completion of the trial; participation in other clinical trials; and pregnancy or breastfeeding. The trial is in compliance with the Helsinki Declaration, and it was approved by the Danish National Committee on Biomedical Research Ethics and the Danish Data Protection Agency. All subjects gave written informed consent before participation in the trial. The trial was registered at ClinicalTrials.gov (NCT02977117) on November 30, 2016. Nonfasting blood samples were drawn before dialysis sessions on days −7, 0, 7, 14, 21, 28, 35, and 42. Serum samples for T50 and fetuin-A were centrifuged at 3000 rpm for 10 minutes at 4°C, after which they were stored at −80°C until the time of analysis. All other samples were analyzed at the local Department of Clinical Biochemistry. Serum samples for T50 were analyzed as previously described (4). Fetuin-A and intact PTH were analyzed using a polyclonal rabbit anti-human antiserum (10) and ADVIA Centaur intact PTH assay (Siemens Healthineers, Erlangen, Germany), respectively. The primary end point was the value of T50 at the end of the intervention period (mean of measurements on days 21 and 28; see below); the difference in the primary end-point was calculated using an unpaired t test. The mean and SD for predialysis T50 in patients with ESKD treated with HD have previously been reported to be approximately 250 and 55 minutes, respectively (11). We considered a between-group difference in T50 of 40 minutes to be clinically relevant. A sample size of 30 subjects per group was sufficient to obtain a power of 80% in an unpaired t test with a significance of 5%. We anticipated a dropout rate of 15% in each group, and therefore, we planned to include a total of 72 subjects randomized in a ratio of 1:1. Paired t tests were used to analyze within-group changes, and unpaired t tests were used to analyze between-group differences. PTH was logarithmically transformed to achieve a normal distribution and later, back transformed to calculate effect size and confidence intervals. Changes over time within each group for T50, Mg, PO4, ionized Ca, HCO3, albumin, and logarithmically transformed PTH were analyzed using linear mixed models with compound symmetry and time as the repeated measure from measurements on days −7, 0, 7, 14, 21, and 28. For the purpose of the data analysis, baseline was defined as the mean of measurements on days −7 and 0, and follow-up was defined as the mean of measurements on days 21 and 28. This was done to minimize the potential effects of fluctuations in variables associated with T50 (i.e., PO4, Ca, Mg, fetuin-A, etc. ), which were unknown before conducting the trial. We used a complete patient analysis (i.e., participants for whom final outcome data were not available were dropped from the analyses). Statistical analyses were performed blinded to treatment allocation. All tests were two sided, with P<0.05 considered statistically significant. All 136 patients undergoing treatment with in-center HD at Nordsjællands Hospital (Hillerod, Denmark) were screened for eligibility. Of these patients, 62 matched the entry criteria for the trial, and 59 gave their consent to participate. We were unable to recruit the planned 72 subjects, because there were not enough patients matching trial criteria at Nordsjællands Hospital; additionally, it was unfeasible to expand the trial to another site. During the trial intervention, one subject withdrew consent on day 9 (high-dialysate Mg group), and one subject died on day 11 (high-dialysate Mg group), thus leaving 57 subjects for the final data analysis (Figure 1). In addition, two subjects died during the 14-day postintervention observational period (one from each treatment group). Baseline characteristics for the two treatment groups are described in Table 1. We had data completeness for the primary end point for all 57 subjects who completed the 28 days of intervention. Participant flow diagram/Consolidated Standards Of Reporting Trials (CONSORT) study diagram. Ca, calcium; Mg, magnesium. After initiation of the intervention on day 0, there was a statistically significant increase in serum Mg in the high-dialysate Mg group, which reached a new plateau on day 7 and was maintained at this level until the end of the intervention on day 28, whereas serum Mg was unchanged in the standard-dialysate Mg group (Figure 2A). Serum Mg was significantly higher in the high-dialysate Mg group compared with the standard-dialysate Mg group at the end of the intervention (between-group difference in serum Mg at follow-up was 0.88 mg/dl; 95% confidence interval, 0.66 to 1.10; P=0.001). On completion of the intervention and return to dialysate Mg of 1.0 mEq/L, serum Mg returned to baseline levels in the high-dialysate Mg group (Figure 2A). Increasing dialysate magnesium (Mg) increases serum Mg (A) and (T50; B) while decreasing serum phosphate (PO4; C) and serum intact parathyroid hormone (PTH; E), but does not affect serum ionized calcium (Ca; D). Black circles indicate dialysate Mg of 1.0 mEq/L; white circles indicate dialysate Mg of 2.0 mEq/L. In parallel to the increase in serum Mg, there was a statistically significant increase in T50 on day 7 in the high-dialysate Mg group, which was maintained for the duration of the intervention (Figure 2B), whereas T50 remained stable in the standard-dialysate Mg group. Again, T50 was significantly higher at the end of the intervention in the high-dialysate Mg group compared with the standard-dialysate Mg group (between-group difference at follow-up was 73 minutes; 95% confidence interval 30 to 116; P<0.001), and on returning to dialysate Mg of 1.0 mEq/L, T50 returned to baseline levels in the high-dialysate Mg group (Figure 2B). There were no significant changes in serum ionized Ca during the intervention (Figure 2D), but PO4 decreased immediately in the high-dialysate Mg group, after which there was a gradual return to baseline values (Figure 2C); although there was no statistically significant difference between the two groups at the end of the intervention, there was a significant change over time for PO4 within the high-dialysate Mg group (Table 2). Also, PTH decreased significantly during the intervention in the high-dialysate Mg group and showed a significant change over time (Figure 2E, Table 2), although PTH was not significantly different at the end of the intervention between the two groups (Table 2). Fetuin-A, HCO3, and albumin were not significantly different between the two treatment groups at the end of the intervention (Table 2). During the intervention, four subjects experienced adverse events (two in each treatment group), and nine experienced serious adverse events (two in the standard-dialysate Mg group and seven in the high-dialysate Mg group), including one death in the high-dialysate Mg group (Supplemental Table 1). During the postintervention observational phase of the trial, there occurred another two adverse events (both in the high-dialysate Mg group) and five serious adverse events (two in the standard-dialysate Mg group and three in the high-dialysate Mg group), including two deaths (one in each treatment group) (Supplemental Table 1). None of these events were attributed to the study intervention, and no subjects were withdrawn from the trial due to serum Mg >4.4 mg/dl. The main result of this trial is that increasing dialysate Mg from 1.0 to 2.0 mEq/L increases (i.e., improves) T50 after 28 days of treatment. This change was observed immediately and in parallel to an increase in serum Mg but with no significant between-group differences at follow-up to other factors known to affect T50 (PO4, Ca, fetuin-A, albumin, and HCO3), indicating that the increase in T50 was indeed caused by the increase in serum Mg. We did, however, also observe a change over time for within-group changes in PO4 and PTH in the high-dialysate Mg group, and it is possible that changes to these factors or related unmeasured factors contributed at least partially to the changes in T50 in addition to the increase in serum Mg. The effect of increasing serum Mg on T50 is likely caused by delaying the time until precipitation of amorphous Ca/PO4 particles (12). This should result in reduced size and increased stability of primary calciprotein particles, which would delay the time until formation of secondary calciprotein particles (4). Theoretically, any intervention that reduces the serum concentrations of calcification promoters (e.g., PO4 or Ca) or increases serum concentrations of calcification inhibitors (e.g., Mg or fetuin-A) should also stabilize primary calciprotein particles and thereby, increase T50 (4). Therefore, it seems likely that increasing serum Mg is just one of several options to improve T50 and that other interventions might also be effective in achieving this goal (e.g., PO4 binders). In line with previous observations, PTH decreased in the high-dialysate Mg group in within-group analyses, possibly reflecting a calcimimetic effect in which Mg stimulates the Ca-sensing receptor of the parathyroid glands (13). This is consistent with a previous in vitro study, which found that increasing Mg reduces the secretion and transcription of PTH from parathyroid cells as well as increases the transcription of the Ca-sensing receptor (14). The decrease in PTH might also account for the acute decrease in PO4 observed in the high-dialysate Mg group. It is likely that any changes to serum PO4 and PTH would also affect T50, and thus, the effect of increasing dialysate Mg on T50 might not exclusively be due to the increase in serum Mg. However, we found no differences in PO4 or PTH between the two treatment groups at follow-up, and the trial was not designed to investigate changes in PO4 and PTH. Therefore, these results should be interpreted with caution. Several in vitro studies have shown that Mg inhibits calcification induced by Ca and PO4, but a recent study has shown that the effect is due to inhibition of amorphous Ca/PO4 and hydroxyapatite formation and not intracellular mechanisms as has previously been proposed (15). Similarly, secondary calciprotein particles induce calcification in vitro, and Mg prolongs the time until formation of secondary calciprotein particles in serum (4). This suggests that the inverse association between serum Mg and cardiovascular events (16) and the in vivo inhibitory effect of Mg supplementation on vascular calcification (17) might be due to the inhibitory effect of Mg on amorphous Ca/PO4 transformation (12) and thus, inhibition of hydroxyapatite and calciprotein particle formation, which in turn, might prevent the formation of calcification. More studies are needed to further examine this association in humans. In this trial, there were more adverse events in the intervention group compared with the control group. However, because none of the events were of a nature typically associated with symptomatic hypermagnesemia (i.e., hypotension, bradycardia, syncope, flushing, or neuromuscular inhibition ), we find it more likely that the observed difference in adverse events is due to mere chance rather than an effect of the intervention itself. Given the relatively small sample size and short duration of the trial, it is not possible to rule out any long-term or rare complications. Because no subjects were withdrawn from the trial due to serum Mg >4.4 mg/dl, symptomatic hypermagnesemia (which typically occurs at serum Mg >4.8 mg/dl) would not be expected as long as serum Mg is <2.9 mg/dl before treatment initiation. Nonetheless, it seems prudent to monitor serum Mg in any patients treated with increased concentrations of dialysate Mg. Although we consider T50 a novel and promising treatment target, a limitation of this trial is that T50 is a surrogate marker associated with cardiovascular and all-cause mortality and is not a hard clinical end point in itself. Whether increasing dialysate Mg has any effect on hard clinical end points will have to be investigated in an adequately powered clinical trial with a long period of follow-up. We were unable to recruit the planned 72 subjects to the trial, and of the 60 subjects who were expected to complete the trial, only 57 completed the entire trial. Given the narrow confidence intervals around the effect estimate, it is highly unlikely that this has affected the main result of the trial. Also, the trial was of a short duration, and it is possible that longer treatment duration might have affected the results of this trial. However, any profound change to these results seems unlikely given that T50 returned to baseline levels immediately after the intervention (i.e., days 35 and 42). Although there was an imbalance between treatment with HD and hemodiafiltration at baseline between the two treatment groups, previous research has shown that there is no difference in T50 reduction with hemodiafiltration compared with HD (11). Also, there is a risk of false positive findings when performing multiple statistical comparisons, which might have affected the results. The strengths of the trial include its randomized, double-blinded, and controlled study design. Also, the intravenous route of Mg administration ensures that there were no issues with treatment nonadherence on behalf of the trial participants. In conclusion, increasing dialysate Mg from 1.0 to 2.0 mEq/L for 28 days significantly increased T50 in subjects with ESKD treated with HD. No incidences of serum Mg >4.4 mg/dl occurred during the trial, and we did not consider any adverse events to be related to the intervention. Further study is needed to investigate whether increasing dialysate Mg improves clinical outcomes in patients with ESKD. A.P. is one of the coinventors of the serum calcification propensity (T50) test and is the CEO and cofounder of Calciscon AG (Bern, Switzerland), which specializes in performing the T50 test. The other authors have no conflicts of interest. The authors would like to thank all of the nurses and staff at the dialysis wards at Nordsjællands Hospital (Hillerod, Denmark) for their tremendous help with conducting the trial. Hanne Laursen of Baxter-Gambro was especially helpful during the planning and initiation of the trial, and Charlotte Bjernved Nielsen kindly prepared the randomization material. See related editorial, “Magnesium Concentration in Dialysate: Is Higher Better?,” on pages 1309–1310. This article contains supplemental material online at http://cjasn.asnjournals.org/lookup/suppl/doi:10.2215/CJN.13921217/-/DCSupplemental.